Aerial view of the devastation in Dominica following successive category five hurricanes in September 2017. United Nations Secretary-General António Guterres visited Dominica on Sunday, taking stock of the immense damage caused by Hurricane Maria last month and the relief efforts underway, as well as paying tribute to its leaders for their vision to not only rebuild but to become the world's first climate-resilient nation. The category-5 storm made landfall on 18 September, thrashing the country with extreme winds and rain. It left people without electricity and water, destroyed homes and health clinics and isolated communities on the mountainous island. The UN and its partners recently launched an appeal for $31.1 million to reach over 90 per cent of Dominicans – some 65,000 people – in the next three months. Speaking at a joint press conference with Prime Minister Roosevelt Skerrit in the capital, Roseau, Mr. Guterres echoed concerns similar to those expressed yesterday during a visit to Antigua and Barbuda, where he witnessed the destruction caused by Hurricane Irma and met with displaced persons. Citing research by the UN World Meteorological Organization (WMO), the Secretary-General said that natural disasters had tripled, while the economic damaged caused by them has increased five-fold. In addition to seeing the destruction by air, Mr. Guterres, accompanied by the Prime Minister, visited Salybia in the Kalinago territory, where they met with local authorities and members of the community during a distribution of relief aid. “We thank you for taking the time to walk with us on this battlefield of shattered lives,” he added at today's press conference. 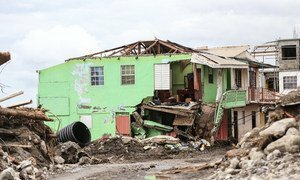 “Our devastation is so complete that our recovery has to be total,” Mr. Skerrit said. “And so we have a unique opportunity to be an example to the world, an example of how an entire nation rebounds from disaster and how an entire nation can be climate resilient for the future. He added that the UN has an important role in guiding Dominica on its journey to become the world's first climate-resistant nation, with good analysis on how to achieve and monitor national climate resilience. Together, the Secretary-General and the Prime Minister also met with UN staff and non-governmental partners, who have set up a coordination centre at a local hotel that suffered heavy damage during the hurricane. Two weeks after Hurricane Maria devastated Dominica, the island nation’s recovery is becoming more evident as the main port has reopened and supplies of food, water and basic necessities are being regularly delivered to the people, a United Nations Resident Coordinator in the region said today, while stressing that are still “major challenges” ahead.